In our on-going mission to provide orphan-relief in Ukraine, we look forward to our annual HopeHouse International Mission Trip Cruise. On this cruise, Christian team members are taken on a cruise down Ukraine’s Dnipro River where we visit 10 orphanages. During this trip we share some much-needed fun, fellowship and Christian messages with children at the orphanages. We also provide necessities such as toothbrushes, toothpaste, shoes, first aid supplies, food and much more to these deserving but needing children. 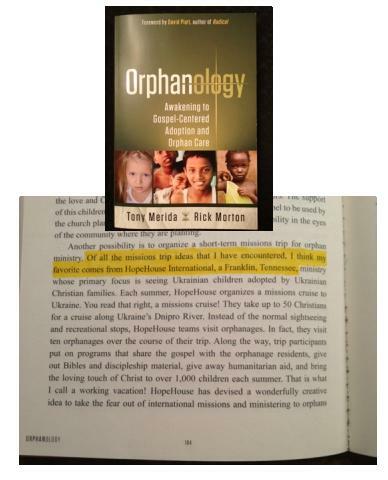 Our missions cruise has become so unique and fun HopeHouse International was recently featured in the book Orphanology by Tony Merida & Rick Morton! We are so thankful to have been included in such a great book and exposing our mission at HopeHouse International to others. Through Orphanology, nearly all of those going on our upcoming Mission Trip Cruise are from team members who found out about us through the Orphanology book. Thank you to all team members and staff who help us make this Missions Trip Cruise possible. We look forward to traveling with you and changing orphan lives.